EVALUATIONS -- Northern Lehigh, Northwestern Lehigh, and Palmerton High School Baseball games will be evaluated for player choices for those players who have already registered. April 7 1:30PM……MEETING, UNIFORM FITTING, FOLLOWED BY A PLAYER TRYOUT for those requesting it (not currently playing high school ball) - at the NYAA upper pavilion near field 4. Immediately after the meeting, we will hold tryouts at the Nearby High School Field for players who do not attend Northern Lehigh, Northwestern Lehigh, or Palmerton High Schools or do not play on one of the 3 varsity teams. There will be a late registration period from April 8 until April 28 with a $25.00 late fee. To get a fair tryout, register on or before April 7, 2018. The Pennsylvania Connie Mack Baseball Program has two leagues in Pennsylvania which are the Bux-Mont and the Lehigh Valley Leagues. There are approximately 40 teams between both leagues. Northwestern and Northern Lehigh School Districts have a combined Connie Mack baseball team which is Northern Valley of the Lehigh Valley League. The team is comprised of 15 and 16 year old players (as of May 1st). In addition to Northern Valley, the league consists of Bangor, Catasaqua, Coplay, East Stroudsburg, Fullerton, Fountain Hill, Freemansburg, Lehigh Bethlehem, Lehigh Township, Lower Macungie, Moore Township, Nazareth, North Central Bethlehem, North Parkland, Northampton, Palmerton, Pen Argyl, Salisbury, South Parkland, and Stroudsburg. The season is comprised of 20 games from mid-May through mid-July (following the high school baseball season). There is a playoff tournament and an All-Star game. Registration Fee: $220 (this is in addition to the $35 annual NYAA family membership fee). Participation in a fundraiser is optional. For more information, visit the Lehigh Valley Connie Mack Baseball League. Each year nearly 100,000 young men participate in American Legion Baseball, the nation’s oldest, and most-respected nationwide baseball program. Through American Legion Post sponsorship in all 50 states these young men learn practical lessons in sportsmanship and citizenship. The tremendous success and longevity of American Legion Baseball would not be possible without the support of hard working American Legion members in our local communities. 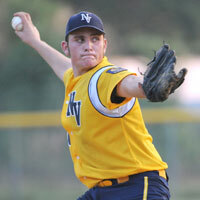 Northwestern and Northern Lehigh School Districts have had a combined Senior Legion baseball team for decades. In the past few years we are pleased that Palmerton has joined our territory. The team name was changed from Northwestern to Northern Valley in 2010. Northern Valley is a member of the Lehigh Valley League. The Lehigh Valley Legion Baseball League was organized in 1941 and currently consists of 10 teams representing 20 high schools in Lehigh and Carbon Counties. In addition to Northern Valley, the league consists of Salisbury, South Parkland, North Parkland, Carbon, Coplay-Fullerton, Lower Macungie, Emmaus, Southern Lehigh, and West Allentown. The team consists of 16 to 19 year old players (as of January 1st). 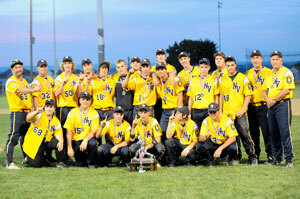 The season is comprised of 16 games from mid-May through mid-July (following the varsity high school baseball season). Four (4) Eastern PA Regional Champions are crowned each year through a tournament playoff and those teams play for the state championship. An All-Star Game is also played. For more information, visit the Lehigh Valley Legion Baseball League. Also visit Legion Baseball History.